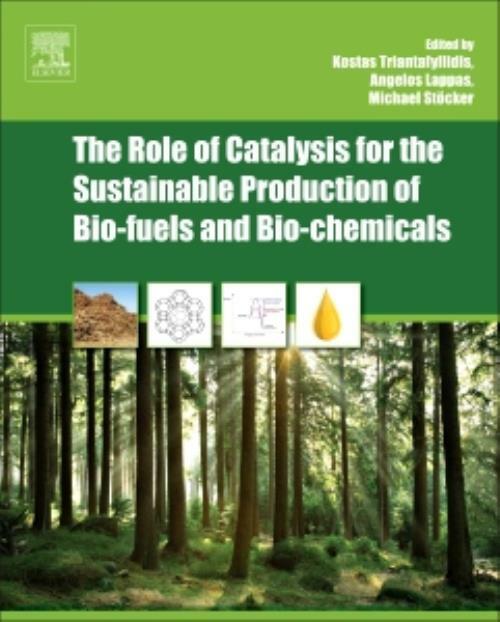 The Role of Catalysis for the Sustainable Production of Bio-fuels and Bio-chemicals describes the importance of catalysis for the sustainable production of biofuels and biochemicals, focused primarily on the state-of-the-art catalysts and catalytic processes expected to play a decisive role in the "green" production of fuels and chemicals from biomass. In addition, the book includes general elements regarding the entire chain of biomass production, conversion, environment, economy, and life-cycle assessment. With energy prices rapidly rising, environmental concerns growing, and regulatory apparatus evolving, this book is a resource with tutorial, research, and technological value for chemists, chemical engineers, policymakers, and students. Professor Kostas Triantafyllidis worked as post-doctoral researcher at the Department of Chemistry, Michigan State University, USA (2000-2002). He then joined the Chemical Process Engineering Research Institute (CPERI) of the Centre for Research and Technology-Hellas (CERTH) in Thessaloniki, Greece, as Assistant Researcher (2002-2004). In 2004, he joined the Department of Chemistry at the Aristotle University of Thessaloniki as Lecturer, and since 2009 is Assistant Professor at the same University and Collaborating Faculty Member of CPERI/CERTH. Angelos Lappas is Research Director at the Chemical Process Engineering Research Institute (CPERI) of the Centre for Research and Technology-Hellas (CERTH). He joined CPERI in 1993 after receiving his BSc and a PhD degree in Chemical Engineering from the Aristotle University of Thessaloniki. Angelos Lappas is in charge of the Laboratory of Environmental Fuels and Hydrocarbons (50 people) in CPERI. He kept positions as teaching assistant in the Aristotle University of Thessaloniki and the Technological Institute of Thessaloniki. Angelos Lappas has implemented more than 25 EU and National research projects and more than 50 industrial contracts, as scientific coordinator. His research fields are: catalytic reaction engineering, refining processing, biomass thermo-chemical conversion processes, production of reformulated fuels and biofuels, fuel quality and characterization. He specializes in biomass catalytic pyrolysis, fluid catalytic cracking (FCC), isomerization, hydrocracking (HYD) processes, emission control technologies and in catalyst deactivation, testing and evaluation. Angelos Lappas has authored or co-authored 60 publications in ISI scientific journals, more than 100 papers in various symposia and conferences, a book and three chapters in books. He is also co-inventor in one patent. Michael Stöcker received his Diploma in Chemistry in 1975 and his Dr. rer. nat. degree in 1979 - both from the University of Münster (Germany). He kept positions as Research Assistant at the Universities of Münster (Germany, 1975-1979) and Bergen (Norway, 1980-1982) before he joined the Center for Industrial Research (SI - now SINTEF) in 1982. In 1988-1989 he had a sabbatical leave at the University of British Columbia in Vancouver (Canada). He is the Emeritus Editor-in-Chief of the scientific journal "Microporous and Mesoporous Materials, published by Elsevier B.V. Furthermore, Michael Stöcker kept side positions as Adjunct Professor at the University of Bergen (Norway, 1999-2004) and the Norwegian University for Science and Technology in Trondheim (Norway, 2004-2007). Michael Stöcker has 30 years experience within the fields of synthesis, characterization and catalytic testing of different type of materials, covering mainly zeolites, micro- and mesoporous materials and oxide materials related to catalysis, sorption technology, surface modification and design of novel processes. Special interests are within spectrocopy (Solid-state NMR, ESR, XPS), micro- and mesoporous materials, zeolites, catalytic cracking, desulphurization, MTO as well as bio-refinery related catalysis. He is the author or co-author of about 155 scientific journal publications (including 10 review papers and 10 Handbook chapters), and is co-inventor of two patents. Michael Stöcker has co-edited two scientific books. He has presented about 130 lectures on a national and international basis, about 65 of them based on invitations. He has been project manager of a number of larger industrial contract research projects, Norwegian Research Council and EU projects. He served on the Board (Council) of the International Zeolites Association (IZA - 1998-2004), as Chairman of the IZA Catalysis Commission (1998-2004 - member since 1994) and as a member of the IZA Synthesis Commission (1992-2004). He is a Member of the Editorial Board of the "Journal of Dispersion Science and Technology. He received the DGMK 2009 Award of the German Society for Petroleum and Coal Science and Technology.